muy bonita radio yo tengo la PANASONIC DR22, modelo en Europa si no me equivoco. La compré en Canarias de segunda mano, está perfecta….saludos desde España. I got a nice Panasonic RF-2200 in a trade! (I gave him $20.00 worth of EBT food, an old “Boom box” got out of the trash and rebuilt and a bit of canned goods! Used up the remnant of my circuit cleaner! And this is one nice well built radio! Thanks for your posts WDX4JPS P.S. anyone know how I can find any accessories for the RF 2200? 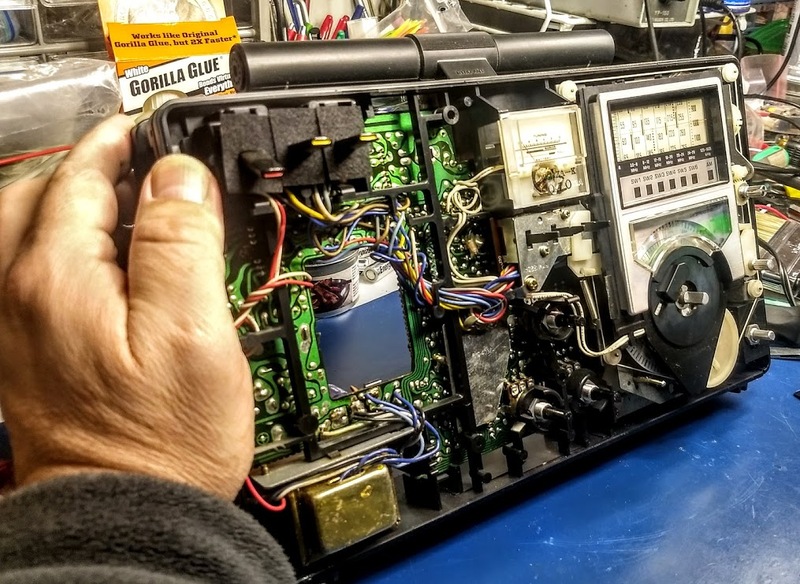 Why hasn’t part 2 of Dr. Vlado repairing the Panasonic RF-2200 ever been posted? According to the comment replies, it was going to be posted soon back in June. Ah yes, that would be my fault. I’ve got the photos for Part 2, but haven’t gotten the post together. I’ll see what I can do. Can’t find the updated part 2. I have an RF2200 that needs cleaning and the AM antenna, while functional, has broken and does not lock upwards from the chassis anymore. It operates fine although I primarily use it only for AM listening now. My parents bought it for me new in the late 70’s and it was my main SWL radio for many years. I also have an RF877 I bought from a local re-sale shop a few years ago. Sadly, he is no longer in business. Yeah–my schedule and Vlado’s have not lined up well this year. Good news, though! I spent the day with him yesterday and the repairs (and re-capping) have been completed! I should be able to post part 2 soon–Vlado and I took a lot of photos. Looking forward to seeing an update, as I am also a RF-2200 owner and I am experiencing the same issues plagued with you set. Thank you. When will part 2 will be posted? I’m curious at what has happened to that radio. Yes by all means keep this interesting post coming! Sounds like Vlado is the man for the job hi hi. I’ve had four of these radios, including the RF-2200s’ European cousin, the National Panasonic DR22. Bought my first ‘2200 in the late ’70’s, new, from Grand Central Radio in NYC. Unquestionably my favorite portable of all time. The RF-2200 I have now was from a swap with another ham. As Vlado is doing, my DR22 (from an EBay auction) was carefully disassembled which requires lots of patience, taking digital photos as reference points, and being organized. Luckily it appeared to be from a non-smoking environment, always a plus when working on vintage stuff. Believe me, smoke gets inside radio chassis and can be seen as a brownish stain which just loves to muck up things. Alignment information (Service manual) can be found on the Internet which helped immensely. I chose not to replace any of the electrolytics; instead I performed the alignment first, and adjustments were required, along with cleaning first with a can of air spray, then DeOxit. It is working well on all bands with AM BCB being exceptional due to the rotatable antenna. One thing to note, at least in my experience with the RF-2200 is that a strong SW station on one band sometimes can be heard (although weaker) when the band switch is turned to the next higher SW band. I experienced this with my brand new 2200 back in the 70’s. Scuttlebutt is this is due to the design of the band switch. To me it is just a minor annoyance in light of all the other fine features this radio possesses. One of the many virtues is that it runs forever on four “D” batteries. It also has a unique tuning knob that can be switched from slow to fast. A BFO toggle also allows reception of SSB and CW another plus. The National Panasonic DR22 looks almost exactly like the 2200 with the exception that it is National Panasonic brand, has a switchable voltage selector (110/220V) port on the back, and in addition the shortwave bands are labeled KW1 – KW6. Have no idea if the internals are any different. There is a Yahoo Group devoted to the RF-2200 that has lots of interesting information on this radio. Lots of great pictures can be found there, along with some early advertisements. In some parts of the world it was branded as the “Cougar 2200.” A separate antenna tuner (RD9820) was also sold and can be found up for auction on Ebay occasionally. Thanks Thomas and Vlado for a great post and pardon the long-winded tome; these radios elicit lots of excitement and nostalgia hi hi. Thanks for all of that background, Mario! Please oh please publish part two, three, four as many as possible. Maybe even a tips and tricks piece from Vlado’s insights – we need as much info as possible to ensure the longevity of these radios!! Just seeing these photos gives me the tiniest bit more confidence to take the covers off!! This is a great story with real life drama. Will Dr. Vlado save the patient, or will it die on the operating table!?!? Looks like a beautiful radio. Bet it would cost a manufacturer $1000 to sell new ones if they tried. Best success in fixing it. I am very interested in this, and look forward to Part 2. I have an RF2800 (“DR28”) and it suffers from similar problems. I only wish I knew a Doctor Vlado here in South Australia. The RF-2800 is a fantastic rig. I know Vlado has worked on radios sent to him from Australia, but they have been more the size of the Sony ICF-SW100. 🙂 Quite a difference in size/weight there!